Southern Cross is located on the Great Eastern Highway, three hours’ drive west of Kalgoorlie. 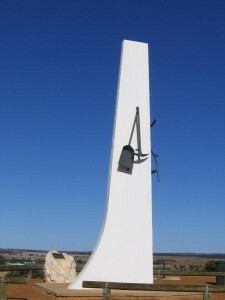 It is the centre for the Yilgarn Shire (Yilgarn is the Aboriginal word for white stone or quartz). The area includes Bullfinch, Marvel Loch, Moorine Rock, Bodallin and Koolyanobbing. Southern Cross is situated in a prosperous, well established farming area including some of the largest farms in the state. The history that surrounds the district complements the beauty and adventure of the Shire of Yilgarn. Baladjie Rock, Frog Rock, Karalee Dam and Hunt’s Soak; all interesting to visit and ideal picnic spots. For a panoramic view of the area, head up to Wimmera Hill Lookout which overlooks the township, the surrounding farmland and goldmines. Just east of town is the old cemetery which was developed as a Pioneer Memorial. Yilgarn History Museum, opened daily, provides a glimpse of the area’s history. Gold was discovered in Southern Cross in 1888 by Tom Risely and Mick Toomey. They named the place after the stars that had been their guide. Today all the streets and the salt lake of the town are named after stars or constellations. The early settlers relied on horse and camel teams to transport goods. Chaff to feed them was expensive and so crops were grown on the 160 acre Miners Homestead blocks. Later, in the 1920s, a number of blocks were opened up as a Soldier Settlement, followed by the Miners’ Settlement project establishing miners suffering from ‘Miners’ Phthisis’ on the land. Yilgarn Agricultural Show – The show has many features and attractions. The Southern Cross Motorcycle Club is famous for holding its annual King of the Cross. This prestigious motorcross event is the richest race in Western Australia with prize money totalling $30,000.